CAPTION: Rodeo - May Pole at Scally Ranch in circa 1920, 20 women riders - In the early 1920's Scally Brothers had an annual rodeo on their ranch whre Vallejo's Lake Currey is now located. 2000 people was the maximum attendance. 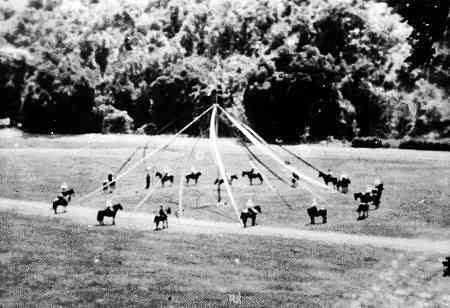 The winding of the May Pole was perormed by 20 girls, with never a side-saddle in the group.